Every June when strawberries burst into gardens and markets near my home, I am reminded of my strawberry-picking expeditions as a child with my dad and sister. My mom agreed to make dozens of pies or fresh jam if we’d pick the strawberries needed. Well, that was all the incentive we needed to spend some serious time in the massive strawberry patches in the countryside near where we lived. Strawberries contain potent nutrients known as anthocyanins, which not only give them their brilliant color and remarkable taste, but also helps reduce the risk of having a heart attack. In a study published in the journal Circulation, researchers found that when young and middle-aged women ate three servings of strawberries weekly, they reduced their risk of having a heart attack by 32 percent. In addition to preventing heart attack risk in people who have heart disease, strawberries help to prevent heart disease in the first place. Strawberries seem to prevent blood clumping, the oxidation of fats needed for heart health (known as lipid peroxidation), and a reduction in damage to the blood vessels. Strawberries are among the top foods that contain vitamin C. They’re excellent sources of vitamin C which helps boost the strength of arteries, prevent bruising and strengthen your body’s stress glands—the adrenals—which require the highest levels of vitamin C of all organs or glands in your body. Nine large strawberries have more vitamin C than a typical orange (106 milligrams in the strawberries versus 98 milligrams in an orange). These delicious berries also contain a potent nutrient known as fisetin, which research in the Journals of Gerontology found may help to prevent Alzheimer’s disease. Fisetin is a natural antioxidant that demonstrates strong brain-protective and anti-inflammatory ability. The same research also found that fisetin reduced memory loss in animals with Alzheimer’s disease. In addition to preventing Alzheimer’s disease, strawberries’ natural fisetin content also demonstrates antidepressant properties. In a study published in the journal Antioxidants and Redox Signalling, researchers found fisetin helps to regulate the feel-good brain hormone known as serotonin, giving it its natural anti-depressant properties. Research has shown that eating strawberries helps to regulate both blood sugar and insulin levels, particularly when eaten after meals. Insulin is a hormone secreted by the pancreas (an organ found on the left side of your abdomen) that controls the amount of sugar in the blood. Additionally, strawberries are low on the glycemic index—a measure of how foods affect blood sugars—making them an excellent choice in the prevention or treatment of diabetes. If you have diabetes, make sure to consult you physician about incorporating strawberries into your eating plan. A study published in the journal Brain Research found that fisetin was helpful in reducing brain and nerve cell damage after a stroke, making strawberries an excellent choice in a post-stroke dietary plan. Strawberries are a good source of fiber and have a high water content, making them an excellent choice to help reduce constipation and maintain bowel regularity. Because strawberries are a good source of the mineral potassium, which offsets some of the damaging effects of excessive sodium in the diet, strawberries are beneficial in regulating blood pressure levels. There are mixed research results on the use of freeze-dried strawberry powder ingestion for the purpose of reducing blood pressure in otherwise healthy subjects, but in those with diabetes, research in the World Journal of Diabetes found that it helped to reduce high blood pressure as well as regulate high cholesterol levels. Fisetin found in strawberries has also been shown to protect against the highly aggressive cancer known as melanoma, according to research published in the Journal of Investigative Dermatology. While melanoma is a type of skin cancer, it can spread throughout the body, so anything that may be helpful in fighting the disease is worthy of consideration. Research in the journal Carcinogenesis found that fisetin effectively killed prostate cancer cells, making strawberries and their potent nutritional constituent a possible aid in the treatment or prevention of the disease. Strawberries have natural anti-inflammatory and anti-pain properties. 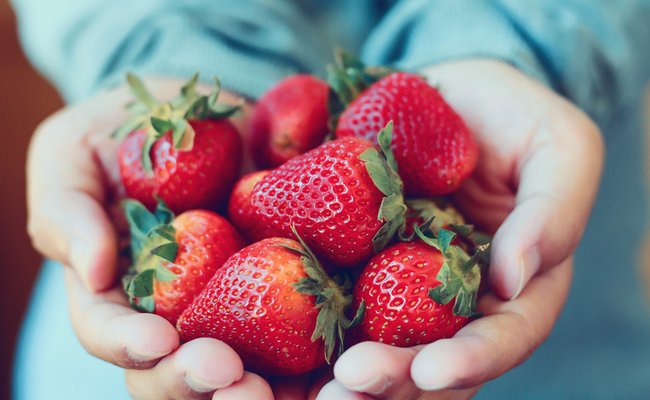 According to a study published in the medical journal Nutrients, researchers found that eating strawberries regularly helped alleviate the pain and inflammation of osteoarthritis in the knees. Strawberries and their constituent fisetin have been found in the journal Antioxidants and Redox Signaling to also help fight against pancreatic and colon cancers. Strawberries contain anthocyanins, which stimulate the burning of stored fat in the body to use as fuel. Research published in The Journal of Agricultural and Food Chemistry showed reductions in weight gain in animals fed a high fat diet among those whose diet included anthocyanins from strawberries. Add fresh or frozen strawberries to smoothies, shakes or blender “juices.” Top whole grain waffles or pancakes with fresh strawberries, blend them with avocado and a pinch of stevia or a small splash of pure maple syrup to create a delicious strawberry pudding, or just enjoy them on their own. strawberries and blueberries my favorites. Eat then any chance I get! So tasty and so good for you.